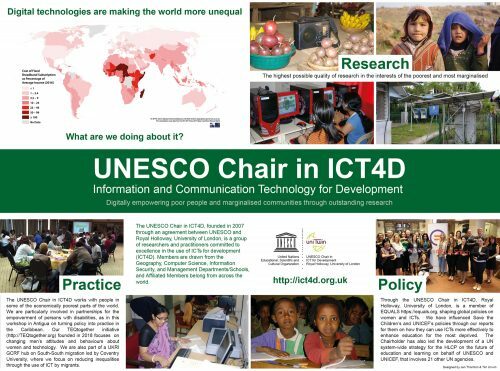 Organised by IFIP WG 9.4, the UNESCO Chair in ICT4D at Royal Holloway University of London, The European University of Tirana and the University of Tirana. By clicking the REGISTER NOW button above you will be directed to https://www.tickettailor.com/events/ifipwg94euro2018/156030 where you can pay securely for your conference ticket. Extended abstract submissions for research papers (2 pages long excluding references) or work-in-progress abstract submissions (1 page long excluding references) should be submitted by the 20th of March 2018. They will be peer-reviewed and collated into an eBook which will be published online with an ISBN. Robert Davison is a Professor of Information Systems at the City University of Hong Kong, currently researching on Knowledge Management and Collaboration in Chinese firms, and the Chair of the IFIP WG 9.4. He has published over 200 articles in a variety of journals and conferences, and his work has been cited in excess of 6500 times (H=41). In a Guide to Publishing in International Journals and Paper Development Workshop Robert will open up the black box of publishing from the perspective of an Editor in Chief of two very different journals: the AIS Basket of 8 “Information Systems Journal” and the niche “Electronic Journal of Information Systems in Developing Countries”. We seek proposals for panel or workshop sessions (1 page long excluding references) on topical issues bridging across multidisciplinary theory and practice, and professional development training workshop sessions on research impact, methods, fieldwork or publishing. We are also seeking extended abstract submissions for research papers (2 pages long excluding references) for presentation at the conference. Work-in-progress abstract submissions (1 page long excluding references) can be submitted for presentation as posters or demo installations. They will be displayed at the conference. The decisions of acceptance will be made based on the extended abstracts that will be included in the final proceedings. The aim is to have a balanced programme and experience, welcoming paper presentations on research, theory and practice, but also creating a space for professional development and networking. Therefore we will not ask for full papers. The full registration tickets include the conference participation fee, a reception on the 22nd of June 2018, coffee breaks and lunches on the 23rd and 24th of June 2018. These fees include a discount of at least 10% for participants from all IFIP member societies. The gala and networking dinner on the 23rd or June 2018 has to be paid separately. *Developing countries are considered those in the OECD DAC List of ODA Recipients: http://www.oecd.org/dac/stats/daclist.htm Participants from developing countries can apply for a bursary by sending a cover letter along with their submission. Decision will be made based on merit and need. ** PhD Students willing to volunteer for facilitating the event can apply for a bursary by sending a cover letter along with their submission. Decision will be made based on merit and need. Priority will be given to local PhD students. *** Online participation is for those who want to submit an extended abstract, but who cannot participate in person in the conference. They will have a chance to interact with the participants at the session when their presentation is scheduled and their contribution will be included in the proceedings. The conference will be hosted at Hotel Tirana International located in the Main Square of Tirana, combining a truly strategic location and breath-taking view of the capital city. Any visitor who holds a valid, multiple entry and previously used visa issued by a Schengen area country, United States, or the United Kingdom, or a residence permit in these countries can enter Albania without a visa for 90 days. Detailed information about the visa policy of Albania for foreign nationals can be accessed here. Tirana International Airport Mother Teresa is about 30 min drive from the hotel. We plan to offer a number of bursaries to attract Graduate Students from universities in developing countries in Europe or outside, researching on topics of interest for the conference that may have difficulty obtaining support from their host institution to attend the conference. Bursaries will be allocated on a merit and need basis. If you wish to apply for a bursary, with your submission, please include a cover letter (1 page) demonstrating your need for financial support.